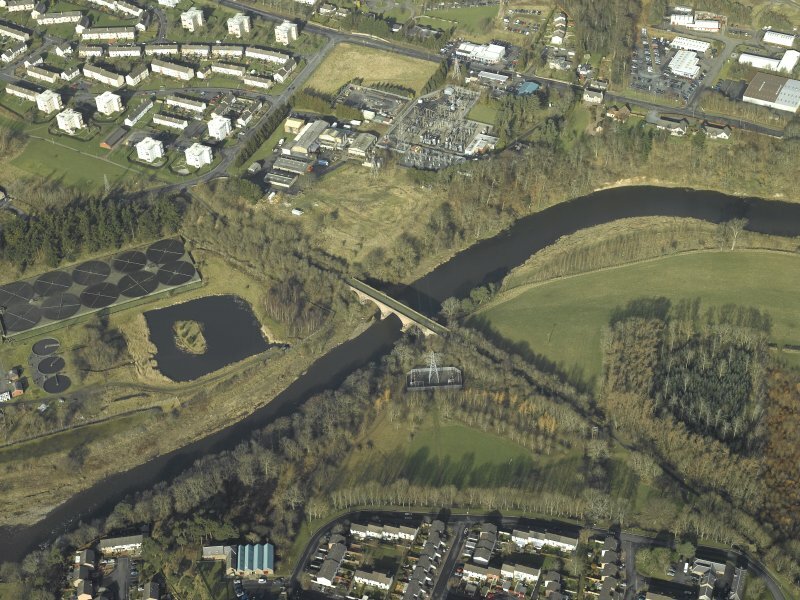 Oblique aerial view centred on Redbridge railway viaduct, taken from the SSE. 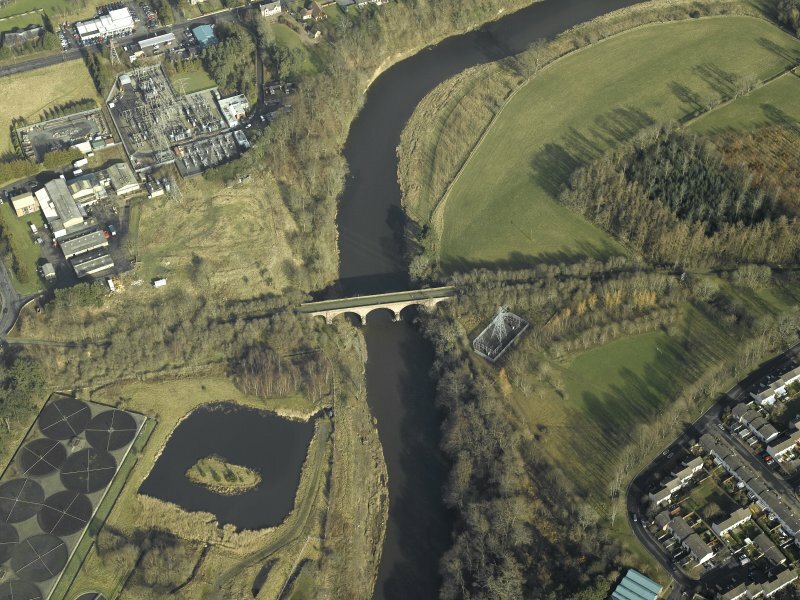 Oblique aerial view of Redbridge Viaduct, looking NE. 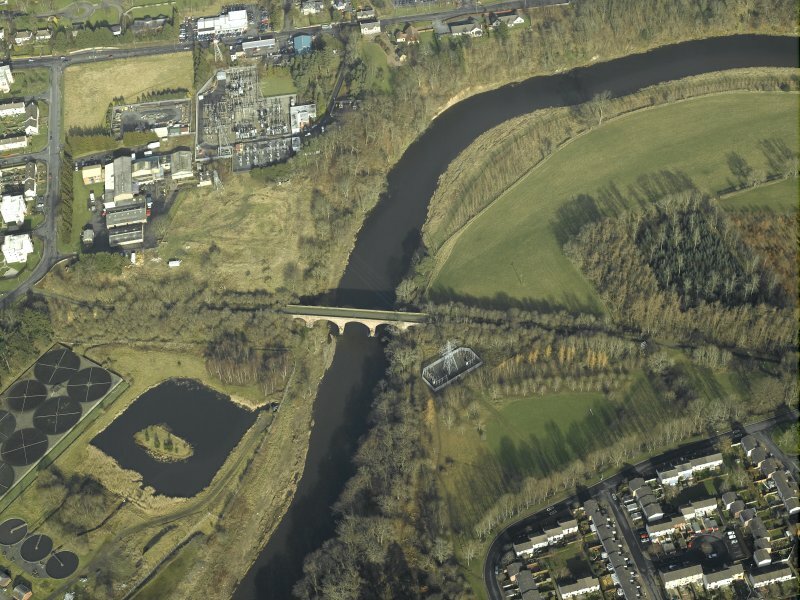 Oblique aerial view of Redbridge Viaduct, looking ENE. Detail of the E side arch. Detail of the bridge deck from WNW. 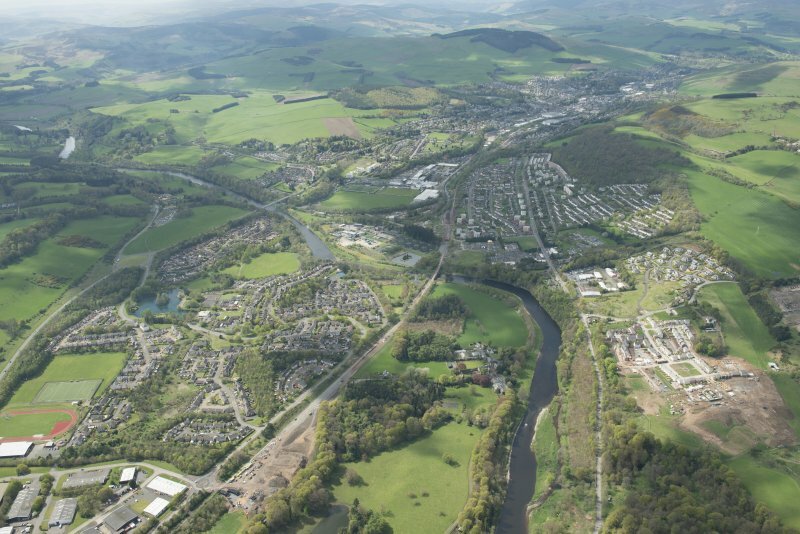 Oblique aerial view of Galashiels, Redbridge Viaduct and construction of the Hawick to Edinburgh Branch Line, looking ESE. 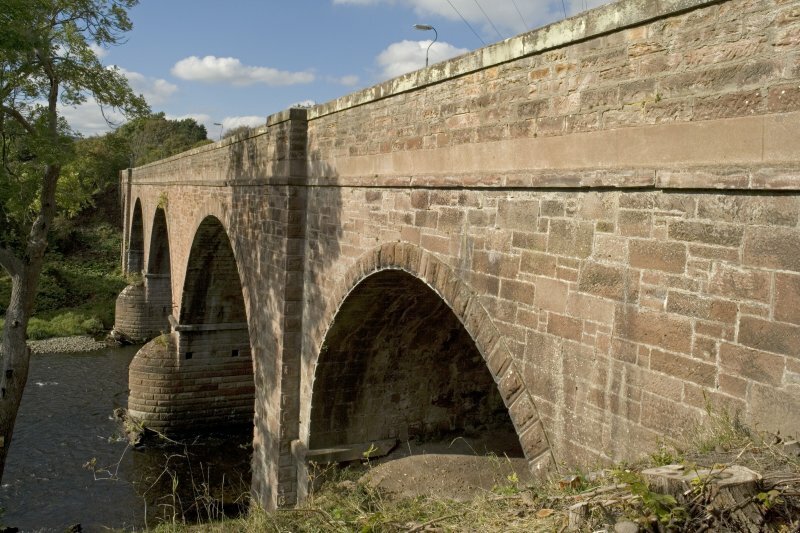 Detail of bridge parapet showing cable supports. 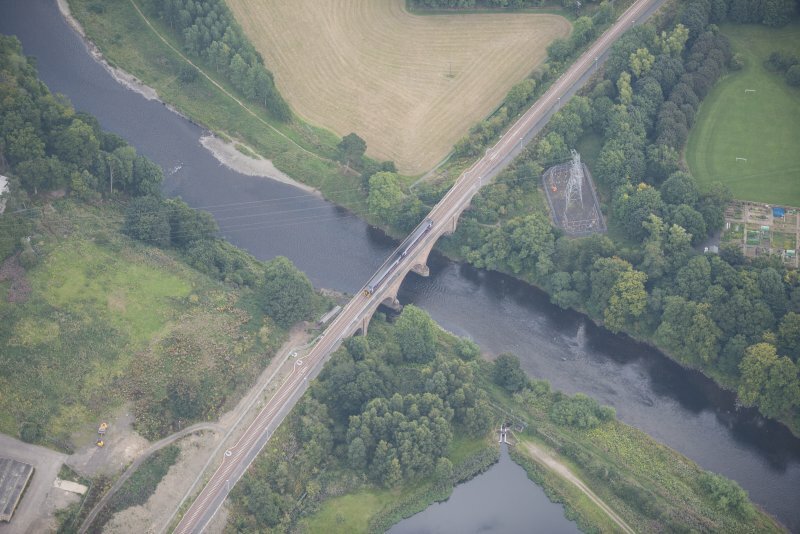 Oblique aerial view of Redbridge Viaduct and construction of the Hawick to Edinburgh Branch Line, looking SE. 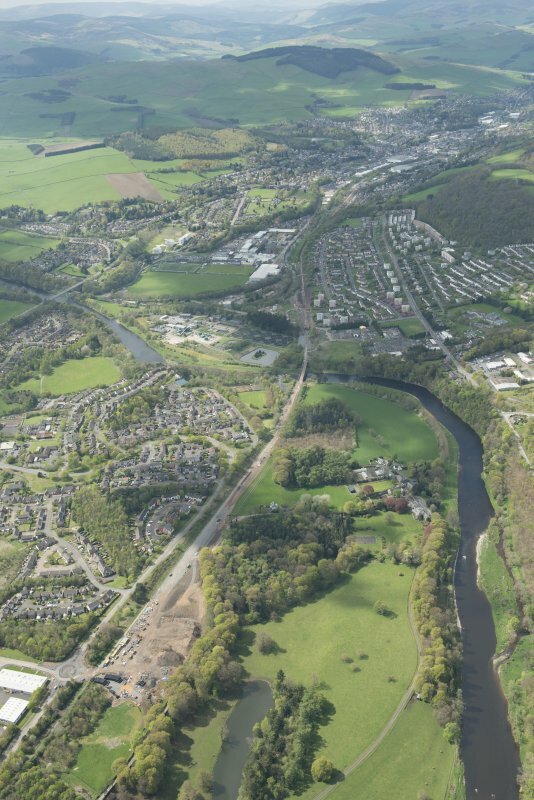 Oblique aerial view of Galashiels, Redbridge Viaduct and construction of the Hawick to Edinburgh Branch Line, looking NW. 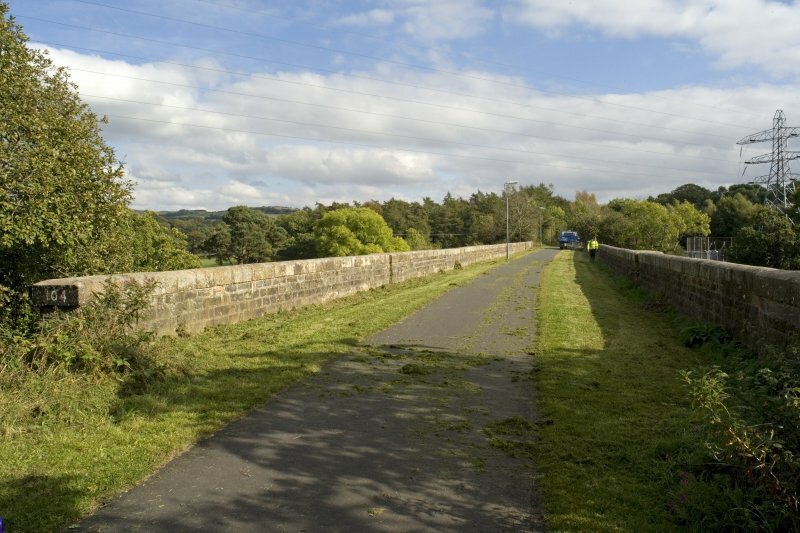 View from NW of viaduct decking with cycle track and stone parapets. 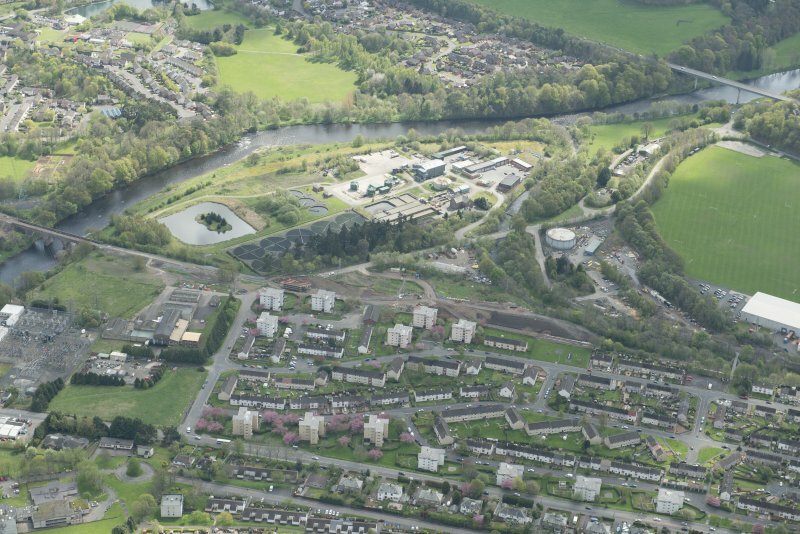 Oblique aerial view centred on Galashiels general and Redbridge railway viaduct, taken from the E.
Oblique aerial view centred on Redbridge railway viaduct, taken from the SE. 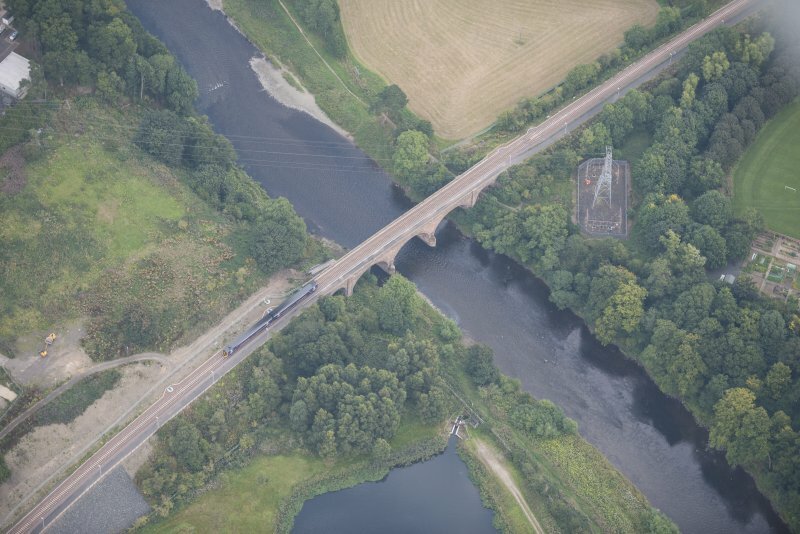 View from ESE of viaduct W side. 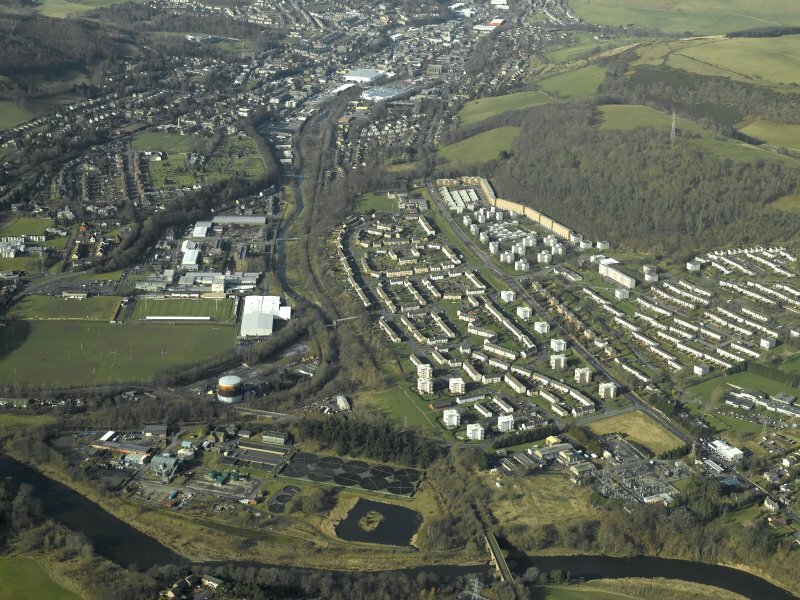 Oblique aerial view centred on Redbridge railway viaduct, taken from the S.
General oblique aerial view centred on Galashiels and Redbridge railway viaduct, taken from the SE. This viaduct formerly carried the Edinburgh - Carlisle main line of the North British Rly (the 'Waverley route') over the River Tweed to the E of Galashiels. 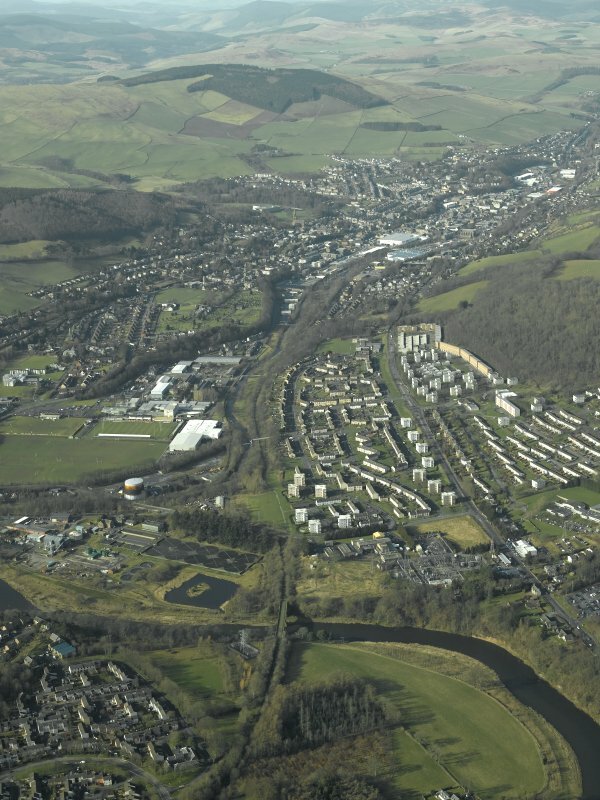 The river here forms the boundary between the parishes of Galashiels (to the W) and Melrose (to the E). The location assigned to this record defines the centre of the span. The available map evidence suggests that it extends from NT c. 51552 35255 to NT c. 51603 35241. 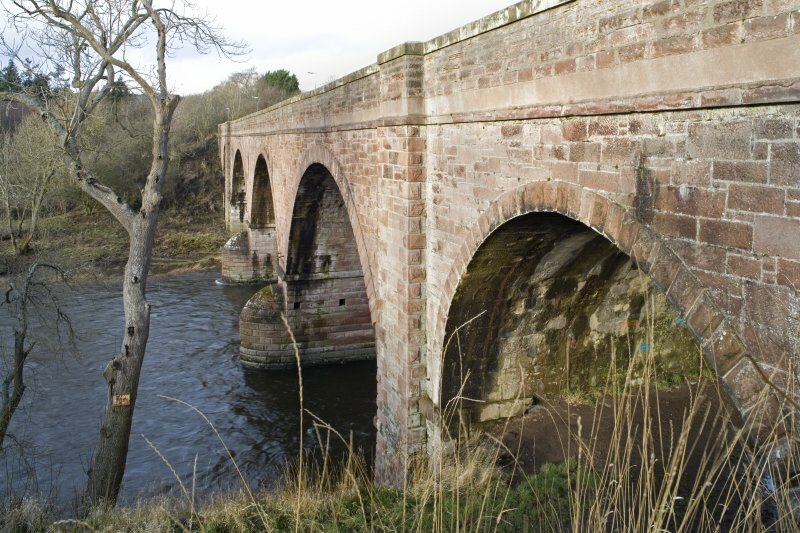 The viaduct is approached along embankments on both sides; the 1972 edition of the OS 1:10,000 map depicts a massive stone abutment to the W of the stream, while the viaduct also crosses a track to the E of the river. 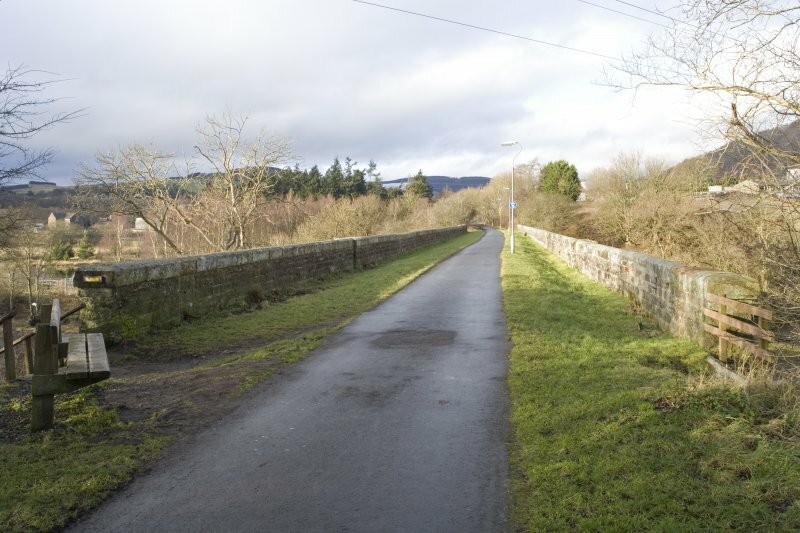 This portion of the Waverley route closed to regular passenger traffic on 6 January 1969. 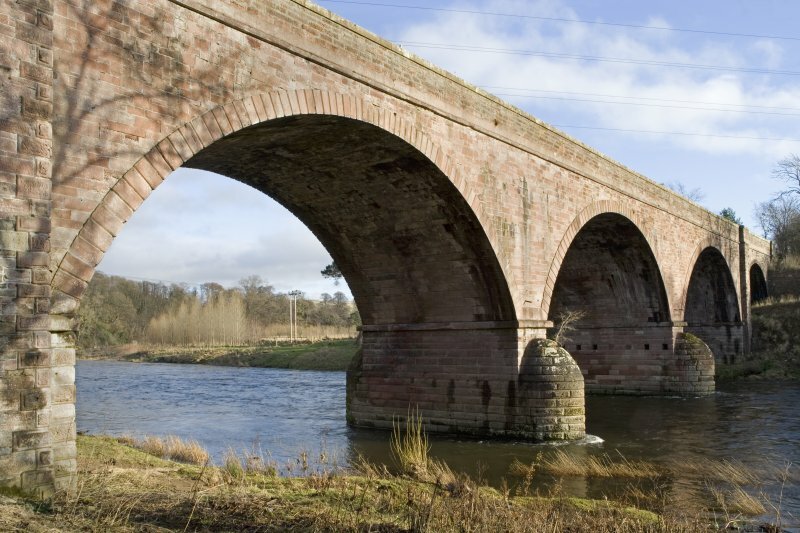 Red sandstone railway viaduct corssing the River Tweed at the Haughead Stream. 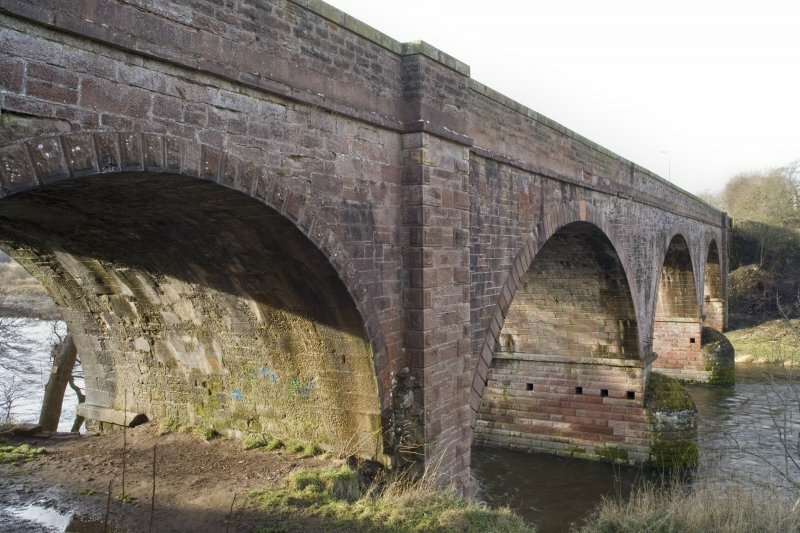 Railway carried on a three main arches in rough sandstone with a smaller fourth over a track than formerly ran to a quarry on the S side of the river. 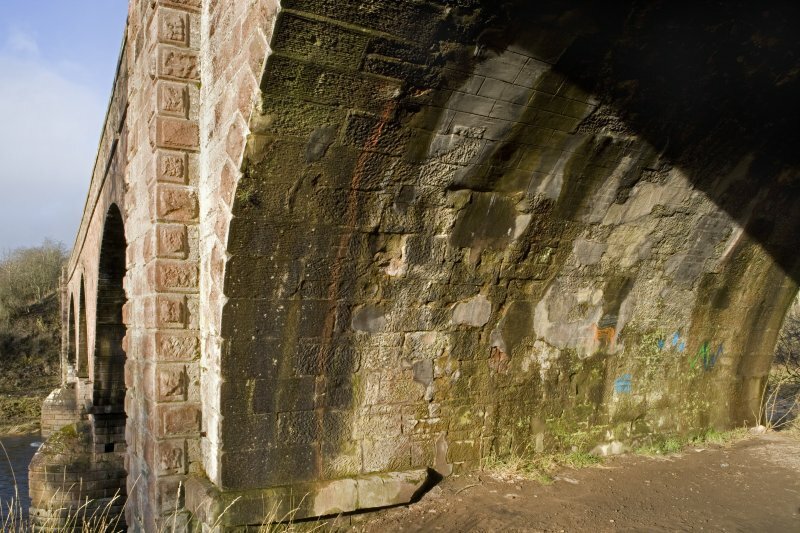 A string course runs at trackbed level. Two cutwaters are of regular sandstone blocks. 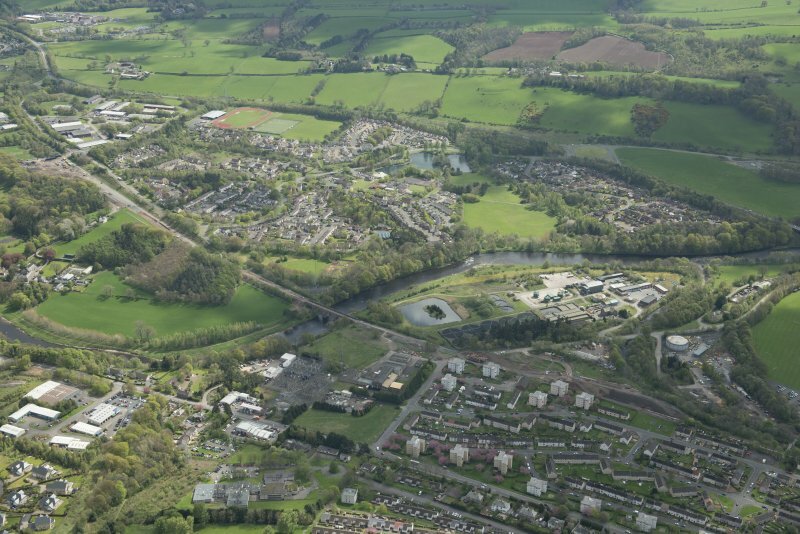 Carlisle. 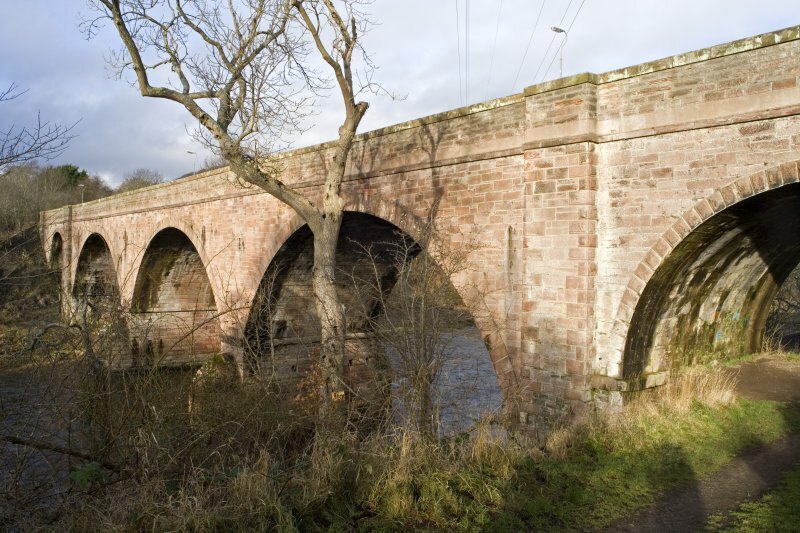 Also known as the Tweed or Redbridge Viaduct, it is constructed of squared sandstone rubble with ashlar voussoirs on its segmental arches. 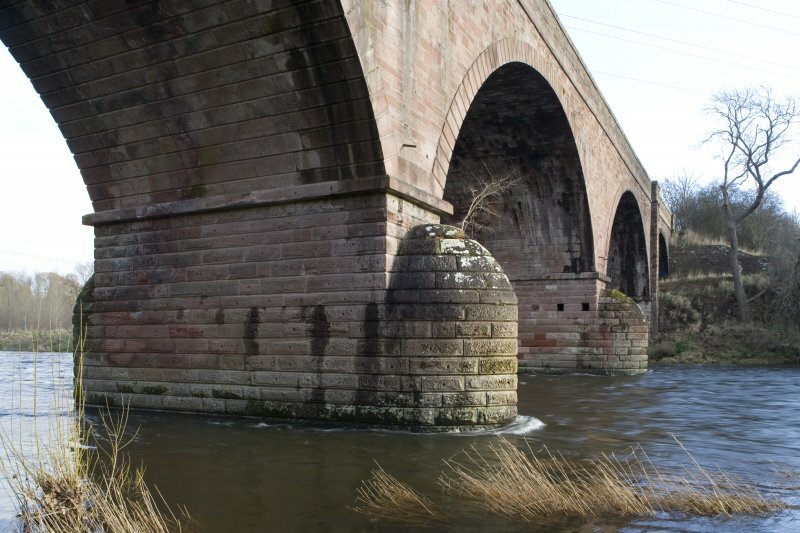 The piers comprise rusticated sandstone with boat-shaped cutwaters on the upstream and down stream sides. 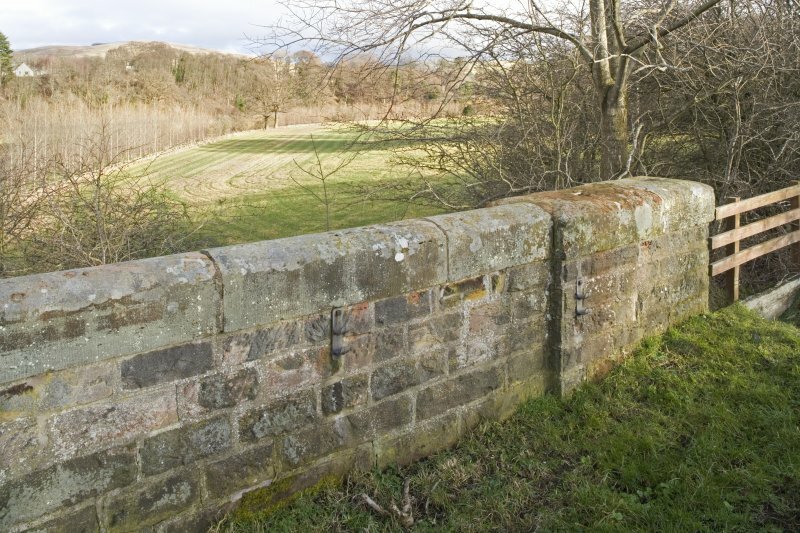 The parapet is constructed of sandstone with ashlar copings. 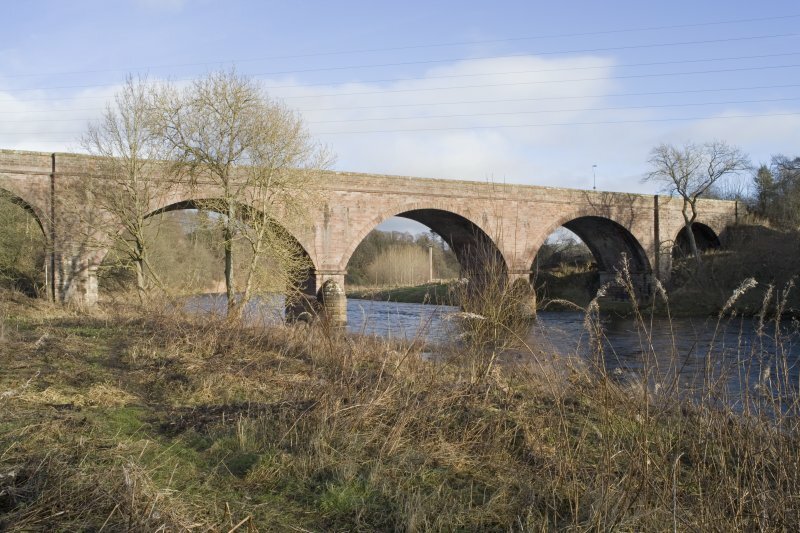 The viaduct is approached along embankments on both sides of the river; the 1972 Ordnance Survey map depicts a massive stone abutment to the west of the stream, while the viaduct also crosses a track to the east of the river.